This device is described in a non-technical format so anyone can understand the concepts, it is an improved version of the Ecklin generators. It seemed logical to me that to produce electricity more efficiently the design of the generator had to be altered to rotate less internal mass with a balanced rotor disc. At the same time it has to allow for a collapsing magnetic field within the coils without rotating the magnets or the coils. Using more powerful neodymium magnets and amorphous coils, I designed the system in such a way as to allow the flux to circulate in a magnetic loop while incorporating magnetic shielding. I performed some simple experiments with magnetic shielding using iron strips, ceramic magnets and small transformers. I positioned the magnets and the transformer stationary opposite of each other with an air gap between the magnet and the transformer. Once the apparatus was assembled I proceeded to move the metal strips in and out of the air gap between the magnet and the transformer which has produced an AC pulse in the stationary coil. Using this principal and refining the design I built a mechanical device incorporating magnetic shielding into the design. I named it the Interference Disc Generator being that the metallic thin iron disc interrupted the magnetic field in the air gap (neutral zone) between the coils and magnets. This method is unique in that it produces electricity with greater efficiency due to both the magnets and coils being stationary, brushes and a commutator in this design are not needed and it requires very little startup torque. The first of this concept came to me in 1985 in Yellowknife NWT as I worked in the mining industry. 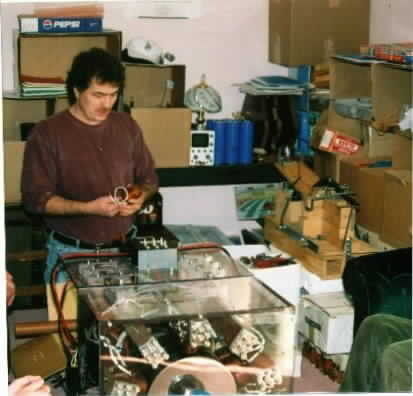 I worked part time in a machine shop in Calgary Alberta in the summer of 1986, this is where I built the components and tested the first Interference Disk Generator. With this information released you will see a schematic diagram blue prints of the first generator prototype with numbers corresponding to parts. You will also see high quality photos of the actual machines during several stages of development and the original description. There is enough information to replicate the device and to improve upon it. I have also replicated the Gary W. Wesley permanent magnet motor from 1879, the magnet motor does seem to produce over unity but it is not connected as a self-runner yet. The neutral zone that Gary W. Wesley talked about is real and it does by pass back EMF. I felt it is worthy of reproducing this interesting device for it is related to the Interference Disc Generator that I constructed many years ago, which also by passes the back EMF. The reproduction of the Gary W. Wesley permanent motor that I have constructed is not exactly the same, for I used two large very powerful neodymium horseshoe magnets that are incorporated into the design. The principal is simular and it does show very interesting results regarding balancing of the Interference shield, this is what contributes to the apparent overunity results. There are no field coils in the design of the reproduced Gary W. Wesley permanent magnet motor. The Interference Disc electrical generator is made of a stator (114) consisting of an array of even number parallel mounted bar magnets (112) arranged and supported (114) in a circular fashion equidistant from each other, where the polarity of the magnets (112) are alternating when viewed at either end. Also in the stator (102) there are twice the number of coils (111) as bar magnets (112) wound in pairs on U-shaped cores (110). One half of the coil pairs mounted at one end of the bar magnets (112) in the same circular fashion, each corresponding to and aligned opposite to a pair of bar magnets (112) and separated from it by an air gap. On the other end of this pair of bar magnets (112) there are another set of coils (111) aligned likewise. *The rotor is made of two magnetically susceptible circular plates (109A or 109B) (such as iron or steel) centrally mounted on an axle (107) which is in respect to the array of magnets and coils. The interference discs (109A or 109B) are separated from each other such that they can rotate in the air gaps between the magnets (112) and the coils (111). The interference discs (109A or 109B) have a number of equidistant opening, either more or less in number than the number of the bar magnets (112). The arrangement and size of the openings are such that when the discs (109A or 109B) are rotated by an outside motive force, they open the magnetic field between adjacent bar magnets (112), and the opposing coils (111) at both ends of the stator (114) simultaneously, hence inducing an alternating electric current in the coils (111). By opening and closing the magnetic influx to the core (110) of the coils (111), an alternating current will be generated in the coils (111) in a retro-order to the rotational direction of the interference discs (109A or 109B). Depending on the number of magnet-coil assemblies three phase AC current can be obtained. The regulation and attenuation of these currents can be achieved by known electric engineering methods. OPTION I AND OPTION II ASSEMBLIES. A variation of this option I or option II generator has been constructed by mounting two sets of magnets (113) of the stator (115) on magnetically susceptible rings (119) such as soft iron. The polarity of the neighboring magnets (113) are alternating N, S, N, S, etc. Adjacent to one ring of the magnets and separated by an air gap are parallel mounted induction coils (111A) corresponding to and aligned with the magnets (113). On the other end of the coils, (111A) are an identical set of magnets (113) arranged in the same manner as the first set, but the polarity is reversed in respect to the coil (111A). Thus if on one of the end plates (123) the magnetic pole facing the coil (111A) is the (N) pole than on the opposite end plate (123A) the (S) pole will face the coil (111A). The rotor (109A or 109B) and it�s configuration is the same as in the first variant (see*), and the induction of AC current, occurring in the same manner and in the same order as described before. This assembly can be constructed in any practical multiple units of the above (123A). No need for brushes or commutator. No back emf is noted upon the spinning balanced interference disc while the coils are loaded. Take a look at the drawings provided, look at the interference disc, one has 11 fins, and the other has 10. I tested a disc with 12 fins, (the same number of magnets) but it had a large static hold on it. I also tested a 10 fin disc with improved results that lead to a reduction of energy input, but the 11 fin disc proved to reduce the drag on the drive motor the most. Using the 10 or 11 fin disc the apparatus needed very little start up torque to rotate the discs. Magnetic balancing of the disc does reduce start up torque on the rotor disc regardless of the number of poles on the disc so long as it is less than the number of magnet poles. Each and every time I changed the disc on the generator it involved a complete dismantle and reassemble to continue the experiments. The horse shoe coil shape was chosen because it provided an easy flow for the magnetic flux and it fit the overall design very well. Using amorphous alloys instead of soft iron in the coils made for a higher efficient coil with less hysteresis losses and with no heat buildup in the coils. I used 14 gauge magnet wire to wind the early coils and I wound several of the coils with approx. 100 to 250 turns of wire, 4 coils with 250 turns of wire each. Four coils with 100 turns each, and the other 4 were used for experimenting with other combinations, there are 12 coils in the early machine and 6 larger (letter I shape) coils in the latest machine. The coils in the larger machine were wound with #12 gauge wire. The efficiency of the unit would vary greatly depending on the speed of rotation, the width of the air gap, the strength of the magnets, and the materials used to construct the coils. I used nickel base amorphous met glass in the coils in both the smaller and larger machines. The efficiency of the machine is inconclusive because my funding was depleted during the testing stage, this has shelved the machine until a later date when I can restore funding to complete the development of this Interference disc generator concept. However I publicize my work in this machine so as to help in your progress and or to give you ideas to advance your projects. The Interference Discs Generators in this document has the potential to produce over unity. Refining the device with tighter tolerances and correctly selected materials and incorporating internal magnetic balancing will add to the success of this unique generator design. Less energy is needed to spin the rotor while causing a moving magnetic field in the coils, It is easy to visualize the advantages this design has over conventional generators and motors. The interference discs will need to be constructed stronger while using rare earth neodymium magnets high permeability steel would be a good choice. Using high permeability steel will reduce the warp in the interference discs allowing for a smaller air gap between the magnets and the coils. I also suggest constructing several layers of metglass shielding material (laminated amorphous alloys) pressed together with very strong epoxy resins. Using amorphous alloys in the interference discs will produce superior magnetic shielding with almost zero hysteresis. The flanges have to be constructed to support the discs and to eliminate the warpage in the disc, at the same being small enough to fit the design and keeping the mass in the rotor/discs to a minimum. Doing these few improvements will equal to a big increase in electrical output and improved efficiency. The characteristics of using the 11 finned disc to balance the rotor disc will have the same effect of reducing start up torque regardless of the type of magnetic material used. The use of high powered rare earth neodymium magnets produces greater amperage output, and increased stress upon the interference discs due to stronger magnetic fields pulling on the discs. Remember to use high permeability high strength steel as the metal of choice for constructing the discs for durability and closer tolerances and less cost. Amorphous metglass shielding material will give you the best results for this application but with an increased cost. There is plenty of room for improvement in this design while the operating principal remains the same. Looking at the photographs included you will see that the 1st generator frame is constructed mainly from aluminum. This metal was used only because it was an inexpensive material and easy to work with for the first test generator. Non magnetic and non-conductive materials should be used to construct the generator frame supports to eliminate the eddy currents. Many of the nuts and bolts used to hold the generator together can be eliminated for they were used just to hold it together for testing. I am sure that you could come up with some real good ideas and improvements of your own with this concept. If you do I would sure like to know so we could all benefit from them. 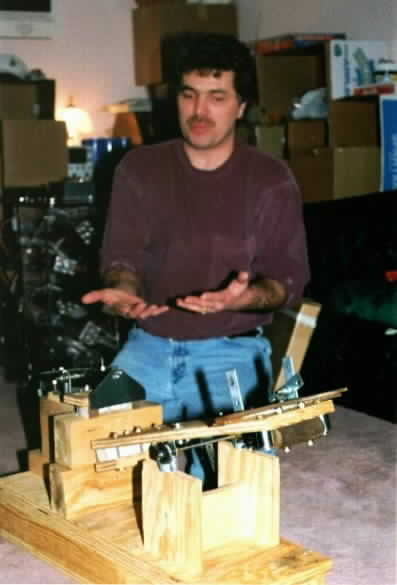 Many improvements were adopted in the next much larger #2 version of the Interference Disc Generator. Phanolic material (non conductive and non magnetic) were used in the frame supporting the magnets and the coils thus eliminating eddy current losses within the frame support. Large aluminum E bars were used to support the magnet frame support and the coil frame support with no noticeable eddy current losses. The aluminum used is positioned further away from the coils and magnets in the larger generator so as not to be affected by the magnets. Much larger neodymium magnets and larger I shaped transformer coils were tested in the larger unit that has an increase in output power over the 1st machine. Using the more powerful neodymium magnets created some problems with the interference discs. Not only did they warp the discs they caused them to vibrate and chatter causing the fins to hit the magnets and the coils. I increased the air gap to over half an inch and moved the disc further away from the magnets to prevent damage. The effect was a reduction of magnetic flux reaching the coils that reduced the power output. The discs must be constructed much stronger and rigid if using neodymium magnet grade 35 or greater. After this has been done the air gap can be closed so more magnetic flux will reach the coils allowing for a greater electrical output. The wiring circuit can be constructed by known engineering methods to rectify the output current, as well the coils are stationary which makes it easy to harness AC power directly from the coils without brushes. The coils can be wired in series or parallel so long as they are in phase, the number of the poles on the interference disc determines the phasing of the coils. Financing had been exsausted with the development of the two Interference Discs Generators. I have over 35 thousand dollars in the development of the generator concept up to this point since 1985-86. I decided to write this report and release the knowledge to the public in the hopes that others will replicated the machine for the advancement of overunity systems. Any one is free to develop and use this technology for the benefit of all in need. I have covered a lot of ground and research in developing the Interference Disc Generator thus far, including replicating the Gary W. Wesley permanent magnet motor. A lot of the home work has been done for you, but more work and refining is needed to perfect the Interference Disc Generator for the ultimate goal of producing an overunity self regenerating permanent magnet machine. I have several machines on the go and I can only complete one at a time, this release is so others can make a contribution to the cause and have a starting point of where I left off with this machine if you choose. I hope this will help you on your quest in reducing your dependency on the grid one way or the other, whether your reproduce the concept or it stimulates even better ideas in your mind. I wish you good fortune and success in developing your own Interference Disc Generator if you chose to take on this challenge. Take what you have learned in this report to your advantage and build your machine at less cost than the authors price tag. I would like to thank my wife Jan and family for their patience and support with the development of all my machines (Inventions) and vapor carburetors to date. The following two emails describe the two photos posted to the JLN discussion list, where Al Francoeur claims to have duplicated the basic Wesley Gary neutral magnetic line effect. Subject: Wesley Magnet Motor reproduction picture's. After hard searching, here are the only two picture's of my Wesley permanent magnet motor that I could find, but they may be a little dark from the scanner. They are taken when it was under construction using wood and horseshoe neodymium magnets that I already have, and other material's from the hardware store, and machine shop. I also used (roller blade) easy turning greaseless stainless steel bearing's to minimize friction on all pivot point's, and allot of sweat (labor of love) while building it. It is the simplest version of the Wesley magnet motor that you can ask for, and it does indeed prove to be very interesting. It did not cost me much to build and if you build one, it should not cost you much either. I used 1/2" x 1/2 x 13&7/8" long iron bar for the balanced arm that holds the shield, and various carburetor spring's with different tensions, as the picture shows. You will have to make adjustments for your version, so make yours so as you can adjust the balancing of all the parts. At the same time on my version, the counter balance on the main rocker is heavier than the horseshoe magnet. The repelling force from the magnet's are more than enough to raise the counter weight to its full highest point against gravity. Gravity then pulls the counter weight down, and at the same time, the horseshoe magnet attracts to the now dropped shield for the next cycle. These picture's were taken a while ago and they show one of my other motor/generator impulse machine's, also, it shows some of the parts of my Interference Disc machine unassembled against the wall beside the large capacitor's, my disc machine is now mostly assembled. My Wesley magnet motor in this picture shows the arm that transfers the rocking motion that activates the shield. If you build one, you can use stacked button magnet's, or rod neo magnet's with a keeper bar in the back so as to make your horseshoe magnet's. Could someone please upload these two picture's into the vault. Thank you very much. Subject: Re: [jlnlabs] Re: Wesley Magnet Motor reproduction picture's. Thanks for the post/pictures on the Wesley motor. I know it is somthing you played with on the side while your heart was with the Generators you were building. Did you actually get it to cycle again and again by itself? Yes I did get it to cycle, but because my device was not built to exact precision machine quality, it would cycle until the timing back fired (sort of speak). Some times the rocking magnet would over shoot, when that happens it would kick real hard up and over the stationary magnet. If your hand was in the way when this happened, it could break it. These 5 inch wide horseshoe neodymium magnets with a 1" x 1" face that I have are very strong. You cannot pull them apart when they are together unless I use strong force to slide them apart, and you cannot push them together when they are in the repelling mode, that is what the shield is for. Because of the shield, It allows the powerful magnet's to come together with ease, like compressing and loading a very strong spring. I actually might build another one, but very precise version of it after I complete my other machine's. I used the information that I gathered from this device to refine my zero input Impulsion permanent magnet motor. It is also related to the Interference disc generator and my large motor/generator impulse machine. Or should I say, a cross between the two machine's. If the answer is yes, I got to build one next week myself. Lots of questions to be answered here about the "nutral" zone and the induced magnets. Also from your experience, do you think you have to use a N/S horseshoe magnet? I have a couple dozen beautiful round ceramic magnets that are N/S on the fat sides (2"X3/8"} and would like to only use one pole in the device. Of course I could use two side by side with a soft steel backing and then have the N/S orientation. You don't even have to use neodymium magnets, but if you want more power, use the neo's. If you do use button magnet's, stack them up so they are longer, then use a soft steel keeper bar with two magnets on the end at right angles to make a horseshoe shape. In this form you will find that your horseshoe magnet will now pick up allot more weight, as compared to just a bar magnet.